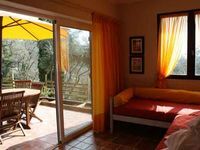 Properties in Saint-Raphaël Valescure Station average 4.6 out of 5 stars. 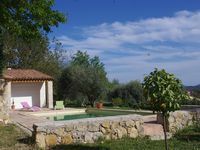 Property 1: Private Studio Situated Next To The Pool, Set In A Lovely Garden in Provence. Property 5: Between sea and mountain: calm, tranquility, full nature! Property 12: Quiet independent studio, close to downtown and beaches. Country cottage fully furnished, in private ownership, quiet. Property 22: Country cottage fully furnished, in private ownership, quiet. 2 detached houses with heated pool, jacuzzi and sea view 6 pers. Property 41: 2 detached houses with heated pool, jacuzzi and sea view 6 pers. Jean, our host, was very accommodating. We showed up in a pouring rain, and he carried our heavy luggage, and provided us with an umbrella. He gave us with some fresh fruits, and to save us an errand that would have required driving back into town, he even supplied us bread he had on hand from his favorite boulangerie. The G&icirc;te was as described, and we particularly liked the views. We sat by the pool in the evening, and then enjoyed dinner and wine on our nice patio. The view was nice from either location. Jean gave us excellent recommendations, including a breathtaking walk along the La C&ocirc;te d'Azur.